Such is the demand for travel that experts expect the global market to double in the next fifteen years, although we believe that fifteen could be closer to eleven! In North America and Europe this summer, nearly 40% of all seats offered in Europe will be operated by low-cost airlines, whilst in South East Asia, 46% of all seats will be operated by these new super-efficient airlines. In China, one of the fastest growing markets on the planet, fewer than 6% of all capacity is currently produced by low-cost airlines; as the market develops that proportion will undoubtedly increase to levels comparable with other markets. The majority of new aircraft orders are, not surprisingly, from low-cost airlines seeking single aisle aircraft such as the A320 and B737 next-generation models that can offer comfortable ranges of up to seven hours. Ryanair have 153 aircraft on order, Southwest 250, Indigo 445 and Lion Air an incredible 456. Even the shortest sighted of pilots would see where the market is heading…. Airlines have always evolved; business models adjusted to reflect both the competitive nature of the industry and the changing customer requirements. In a market where price is frequently the driver of consumer choice then for those airlines that want to survive, an obsession with cost is crucial. And although airport costs are but a small proportion of an airlines’ overall cost, it is one on which they are obsessed in securing the sharpest and lowest cost possible. Part of that obsession with cost is linked to the fragile operating margins of the airline industry. Whilst IATA, the industry trade association reports record profits for airlines in 2017 they fail to recognise the massive regional disparity of those profits. The Association of Asia Pacific Airlines recently reported revenues of some US$166 Billion across their membership and US$7 Billion of net profit; a fragile 4.2% margin. As an industry, managing the expected market growth within numerous infrastructure constraints is a key issue only now being faced. Analysis from IATA of airports handling more than 20 million passengers per annum has identified 26 airports in Asia alone that are already either congested and many of those airports are expected to see double digit growth in the next decade. Airport and smart airport operators are now looking at biometrics and AI as a means of handling some of these issues, processes, efficiency and security are key themes for many airports. Expansive, luxurious, creative designs are not quite in line with how the market is moving and the customers needs. Accordingly, airports that offer lighting similar to that seen in a rain forest, architectural waves similar to an aircraft or embossed tented shapes tend to lead to airline CEO’s smelling cost and there is nothing worse than an airline CEO feeling that they are paying for some grand national or political statement. At the opening of the T2 facility in Dublin, Michael O’Leary the CEO of Ryanair arrived in a hearse carrying a coffin announcing the “death of Irish tourism” as operating cost increased. Willie Walsh the CEO of IAG has been vociferous in his thoughts on Heathrow and the cost of a 3rd runway and associated infrastructure. The days when palaces were constructed and named as the latest terminal building are over; the market has moved on. Airlines, and indeed successful airports, will be based around extremely functional, process-based facilities similar to sports arenas and concert halls. 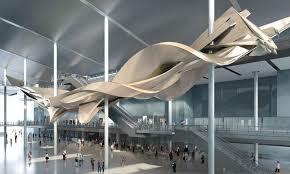 Building an airport with cocoon’s or Teflon coated tents may win design awards and excite some but for airlines getting their customers on-board and having their aircraft depart on time is the only thing that matters.